"So, that's the last of them." My dad probably wasn't the only Hibs fan of a certain age to say something like that when he heard the news of Lawrie Reilly's death. "Them" are the Famous Five, for some generations of Hibs fans the quintet that will forever be the best of us. For the rest of us, those that didn't see them play - and it's now 55 years since Reilly last played - their achievements are sustained through the record books and through the colourful tales of of those who were there when Reilly and his four mates took Hibs to the top of Scottish football. Gordon Smith, Bobby Johnstone, Willie Ormond, Eddie Turnbull and Reilly. Different backgrounds, different styles, different personalities. Collectively admired and feared, a chunk of Scottish football history and at the very heart of Hibs. How do the generations that have come since Lawrie Reilly’s career was ended by injury before he reached the age of 30 measure his contribution and impact? 38 Scotland caps - the biggest haul of any of the Famous Five, more caps than any other player has won while playing for Hibs. 22 Scotland goals - beaten only by Kenny Dalglish, Denis Law and Hughie Gallacher. Although on a goals to game ratio only Gallacher tops Reilly. 187 goals for Hibs in 233 leagues games and another 47 in cup competitions - only Gordon Smith, a first team regular for longer and whose career covered the years of the Second World War scored more. But statistics don’t tell the whole story. The league goals contributed to a period when Hibs won three league titles, when the Famous Five's battles with the Iron Curtain of Rangers defined the post-war boom in Scottish football and when the honours in that clash of collectives so often came back to Leith. The five goals against England at Wembley, including the important late goal in 1953 that earned him the nickname "last minute Reilly." For a heady period in the early 1950s Hibs fans must indeed have felt that they were living in 'Reilly time' - when no defence was safe from a player Hugh McIlvanney described as an "unsubduable plunderer." The young Hibs fan who played for his childhood heroes for the length of his career. The Edinburgh boy who inherited a love of Hibs from his father and grandfather, who went on to become one of Easter Road's most celebrated players, a forward feared throughout Britain and beyond who didn't have to leave Leith to find acclaim. A career from a different age that has echoed down the years. There was steel in there as well, defenders in Reilly's era didn't believe in half measures. Reilly took the knocks and still scored goals. 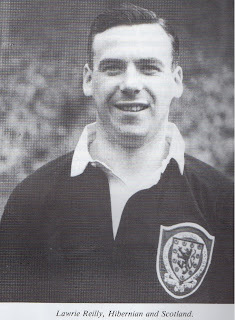 The stubborn streak that saw him recover from injuries - and from the pleurisy that kept him out of the 1954 World Cup - manifested itself in a financial dispute with Hibs. Although eventually resolved it was a disagreement that robbed him, at the peak of his powers, of the chance to increase that impressive goals tally. The stories that will be recounted in the coming days about the life and times of Lawrie Reilly are too plentiful to do justice to here. Of a young Lawrie, awestruck but emboldened, asking Gordon Smith if he fancied coming home for tea after he’d watched the great Smith play for Hibs at Tynecastle. Smith politely declined, within a few short years the great winger would be creating goal after goal for his young fan. A favourite, if apocryphal, tale of many a Hibs fan of a certain generation - of Reilly marking another headed goal for a select side by shaking his fist at the celebrated Stanley Matthews: "When Gordon Smith crosses the ball he makes sure the laces are facing away from my head." Among all the changes that Scottish football has seen since the pomp of Lawrie Reilly, the greatest is perhaps the idea of Hibs producing a one club man who could be so widely celebrated across the game. When Hibs inaugurated their Hall of Fame a few years ago, Reilly and Turnbull were the only living members of the Famous Five. Turnbull, walking with the aid of sticks but the fire clearly still burning, was as forthright and rumbustious as ever. "I was born a Hibby and I’ll die a Hibby." As ever with Lawrie Reilly, a simple statement of fact. One that has come to pass sooner than we hoped or expected. I was lucky enough to be in his company on a few occasions. If he seemed slightly bemused that younger generations remained starstruck by his achievements, he could still delight in a shared support for Hibs. I passed him on the stairs leaving the stand after the 6-2 win over Hearts. The beaming smile reflected how we all felt. Not that his support wasn't healthily critical. At a Q&A session a few years ago he was asked about the current Hibs team. Gentleman to the last he apologised for the language he was about to use before describing the side - of Paatelainen or Hughes vintage - as being "crap really." A few months ago Pat Fenlon said he hadn’t really been aware of the richness of Hibs' history in his first months as manager at Easter Road. He could have done worse than sitting down for a chat with Lawrie Reilly - the fan, the history, the legend and the ambassador rolled into one. The last of "them," the best of Hibs. Smith, Johnstone, Reilly, Turnbull, Ormond we won’t see again. But their memory marches on.